Now a member of faculty at Tainan University of Technology, Huang Wen-jen (黃文人) has never lost her love for Yanpu Township in Pingtung, where she was brought up. 907 Kilometers (907公里數) for her Seed Dance Company (種子舞團) is another in what seems to be an increasingly common theme: memories of home, the ‘907’ in the title coming from the town’s postcode, while ‘Kilometers’ denotes distance and time. The work recalls Huang’s memories of childhood, the family pig farm and the building of a rehearsal studio next to that farm; a world that has largely gone as fields became housing and roads. 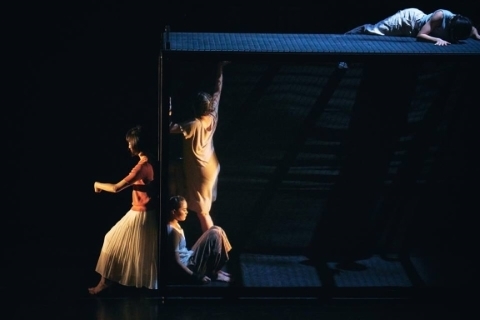 The best moments come in and around a box fronted by a gauze that represents a building and also provides a great platform, the dancers making full use of every surface: floor, walls, ceiling and roof. The gauze not only allows us to see into the box but provides an effective sense of peering into times long gone. Particularly impressive here was Cheng Yi-ting (鄭伊庭), a dancer full of expressive quality, who appeared as a sort of almost ghostly figure from the past wandering through the scene. 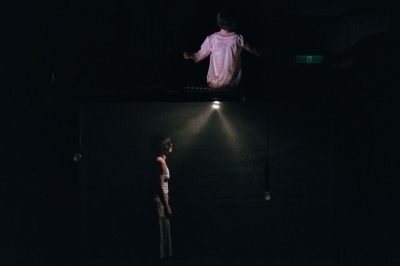 The gauze also makes an excellent screen for the projections, some of which the choreography interacts with. Huang wisely keeps the technology to a minimum, though, never letting it get in the way of the live action. Some of it works well. The view from a train window giving a good sense of distance. The modern footage of the farm showing heavily confined pigs seems out of kilter with the theme of looking back though and doesn’t fit the mood. Pigs are clean animals in many ways but 907 Kilometers presents a very cleansed view of pig farming. Interesting is what is missing, including any sense of pig factory processing and machinery, or of the workers. It was as if the less pleasant aspects of the business had been airbrushed out. But maybe that’s how memories are. At times, it is not a huge leap from dancers to livestock, the performers crawling around and other and nestling like piglets might with their mother. The cast reach up, often on each others’ shoulders, towards the many lights that represent the lights in the pig units that provide heat and warmth, coming together when they go out. The constant up and down of the lights, never done smoothly, actually became an irritant, though. At other times, meaning was more symbolic, especially in the faster ensemble sections that have a freedom and life about them that can perhaps only be understood by one who was brought up in the countryside and returns, if only in the mind. And 907 Kilometers is full of dance, Huang using her cast in various solo, duet and ensemble formations, but while satisfying enough, they rarely compel. It doesn’t help that she often pairs action stage right with action in and around the box, set to the left; not so much split screen as two-screen, and far enough apart that you can’t properly watch both. The box won every time. At least we could see that. I would love to tell you more about the opening floor-based duet. Straining, I could just make out two dancers shifting around one another like multi-conjoined twins. I suspect it was interesting but it was performed so far downstage that unless you were in the front two or three rows it was all but invisible through the heads of the audience. Memo to all choreographers: please place action where it can be seen when the theatre is full. The choreography is very musical, although perhaps too much so with accents and speed being met in each other every time. The music is terribly sentimental and somnolent, the sort of new-age nothingness that easily sends you to sleep. That it didn’t says much for the dance and dancers. As pleasant as it is, 907 Kilometers is a work that only occasionally transmits depth and feeling, or any hankering for the past. When it does, it’s always through the slower imagery. It’s almost as if while Huang wants to show us her memories, the curtain has only been opened so far and there is a side to her subconscious that is simultaneously pushing back, perhaps understandably saying we should only see so much and the rest should remain private.